After five months of intensive care treatment, the world’s smallest baby has been discharged from a Tokyo hospital. Born at 268 grams the boy managed to increase his weight tenfold. The smallest surviving male baby, born weighing just 268 grams (9.45 ounces), has been sent home after months in a Toyko hospital. 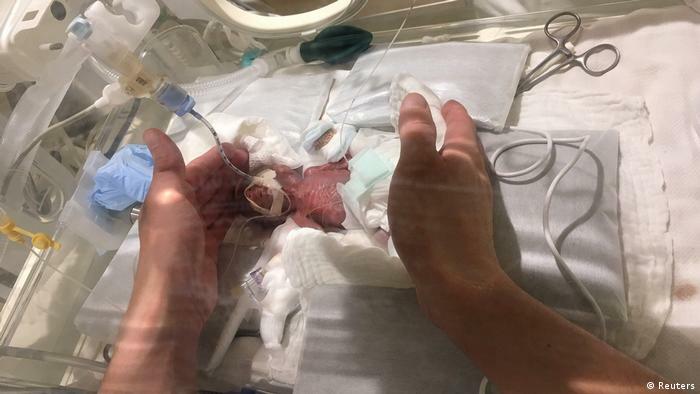 The boy was delivered at 24 weeks through Caesarean section in August after he failed to gain weight during the pregnancy and doctors feared his life was in danger. After five months of treatment in intensive care, he now weighs 3.2 kilograms (7.1 pounds) and is feeding normally, Keio University hospital said. “I am grateful that he has grown this big because, honestly, I wasn’t sure he could survive,” the boy’s mother said. The previous record for smallest baby was held by a boy in Germany who, in 2009, was born weighing 274 grams, according to the University of Iowa’s Tiniest Babies registry.